Is Brisbane’s City Cycle Bike Share Scheme a Fail? Posted March 26th, 2014 by Hoffy Cycles. 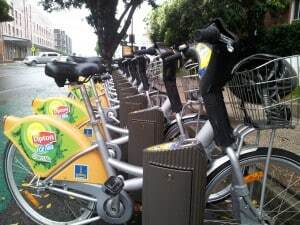 Following the lead from other international cities, the introduction of the Brisbane’s very own bike share scheme hasn’t been without controversy, often maligned as a complete waste of tax payer money. Since its introduction in 2010, usage numbers have been very low, and when compared to similar, more established bike share schemes it seems like for now at least the CityCycle scheme has failed – at least when measured against how many times a bike is used each day. With 150 stations around the inner suburbs of Brisbane and more than 2000 bikes, each bike has only an average on 0.4 trips daily. The stations with the highest usage rates were around the Southbank and South Brisbane areas, while many of the docking stations in Fortitude Valley and the CBD struggled to find any users per day at all. The good news for supporters of the system is that almost four years on from rollout usage numbers have been increasing by around 15 per cent each year – although admittedly are still much lower than what was forecast. Numbers however were realistically never going to be as high as European cities like Paris and London with a much denser population living in the inner city. There are though many reasons why usage rates of the Brisbane scheme have been lower than expected. Why have usage rates been so low? Helmet Laws – Australia’s mandatory helmet laws and only some bikes being equipped with helmets mean that if helmet laws are to continue to compulsory most bikes will need to be supplied with helmets – a helmet is not something people will carry around. Spontaneous use of the bikes needs to be encouraged. Ease of use – The sign up process has also been condemned by critics as overcomplicated and prohibitive. Apprehension to the safety of cycling – There is a strong perception from many Brisbane residents about the safety of cycling on roads. This will take time to change but recent Queensland bike safety laws and more bikeways are helping to address safety concerns. With all that’s been said against the system, it’s also worth remembering some of the benefits of having a bike sharing scheme in our city. It’s a great way to get out and see the city, it’s absolutely free if a trip is no longer than 30 minutes (it is easy to swap over bikes at each station to avoid having to pay) and they provide a great way to improve public health, while helping to reduce congestion and emissions. The more the system is embraced, the greater these benefits will be experienced, but a large part of this is in making the system more convenient and accessible for all people. Some of these issues affecting usage rates are already beginning to be addressed in parliament including an exemption for wearing a helmet when using the system, as well as the introduction of a single use by swiping a credit card. 24 hours use is also being trialled to allow more flexibility for users. With a system that’s here to stay, ironing out some of the kinks now will hopefully lead to a scheme that is celebrated instead of bemoaned. Time will tell! One thing is certain, bike hire is a great way to get outdoors, build fitness and see the sights. Hoffy Cycles offer full and half day bike hire around Sandgate and the Redcliffe peninsula with lots of established bike paths and cycle ways to see the beautiful Brisbane bayside. Visit us today at 10 Bowser Pde Sangate and explore the best that the region has to offer.